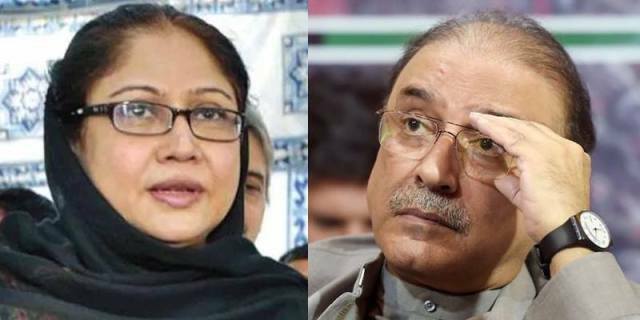 Asif Ali Zardari and Faryal Talpur barred from flying abroad in connection to a money-laundering case by the Federal Investigation Agency (FIA), news sources. As indicated by sources, the Pakistan Peoples Party (PPP) co-chairperson is among seven others set on the ‘barred list’ — a temporary list of the FIA banning suspects from flying abroad before being placed on the ECL (Exit Control List), officially. Others include Nazli Majeed, Ali Kamal Majeed, Iqbal Khan Noori and Mustafa Zulqarnain. PPP Chairman Bilawal Bhutto Zardari has likewise called for a meeting on issue developing later in Lahore today. The FIA enrolled a case in Karachi week ago over money laundering scam worth Rs35 billion, said to involve lawmakers, representatives, and financiers. FIA detained Stock Exchange of Pakistan executive Hussain Lawai, said to be a close friend of Asif Ali Zardari two days earlier. FIA authorities keep up that 32 individuals, including Lawai, are under interrogation for laundering billions of rupees through imaginary ledgers. FIA sources are said to be black money gathered from various kickbacks, commissions, and bribes. But despite these huge transactions, the bank authorities never reported them to the authorities concerned including FIA. The Supreme Court has directed authorities to put the names of heads of three banks on ECL on Sunday, order followed after Chief Justice of Pakistan Justice Mian Saqib Nisar took notice of the slowed investigation process into the case. The SC also summoned seven phony account holder and other 13 legatees on July the 12th.